Back in September, I posted a review of Ta-Nehisi Coates' Between the World and Me. The book is often compared to James Baldwin's The Fire Next Time, so I took the opportunity recently to read Baldwin's work. While I can certainly understand the parallels between the two books, I think they are absolutely complementary and having read one only makes your experience of the other even better. James Baldwin's book was written in 1963, a response to the centennial of the Emancipation Proclamation. It is deeply personal, a call to action to all Americans to accept that this has always been a multi-cultural, multi-racial society. Baldwin has so many strengths in the way he writes, but the one that most draws me in is the passion that he puts into every word. You can almost imagine him sobbing as he writes about his difficult relationship with religion, clenching his fist as he tells us about the many times he's been treated badly. And yet, through it all, he stresses kindness and compassion over anger and revenge. This is a deeply intimate book, and I can only imagine how much it took out of Baldwin to write it, to share his own story and his own misgivings and so much of himself. It truly is a thoughtful, articulate, and beautifully written book, and I hope you will read it. Immediately after finishing The Fire Next Time, I read a recently-released young adult novel called All-American Boys. 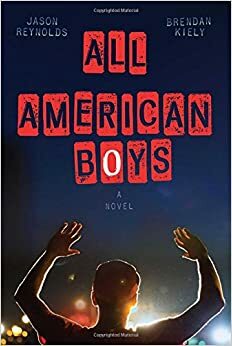 The novel is written by two authors, Jason Reynolds and Brendan Kiely, and has two narrators, Rashad and Quinn. Rashad is the victim of police violence when a cop assumes that he was trying to steal a bag of chips. Quinn witnesses his best friend's older brother beating up a kid outside a convenience store. In case you didn't already assume - Rashad is black, and Quinn is white. I first heard about this book in the New York Times Book Review, and honestly, the review is pretty much spot on. I highly recommend you to just go read that one. It convinced me to immediately request this book from the library, and I hope it convinces you to read it, too. What I appreciate most about this book is that it takes both Rashad's and Quinn's journeys seriously. While Rashad lays in a hospital bed recovering from a broken nose, broken ribs, internal bleeding and more (which, even when you give a cop the benefit of the doubt, is a terrifyingly extreme reaction to someone getting a bag of chips), he feels vulnerable and scared. One scene that especially stood out to me was when Rashad's father was grilling him about the incident, demanding to know why he would steal, why he would resist arrest, why he would fight. It's clear that he wants so badly to believe that if you just follow the rules, if you are a good person, then you will be safe. But Rashad did all of that and still ended up in the hospital. And it could happen to him again. And it made his father feel so powerless and frightened to know that he could not protect his son from that. Quinn, on the other hand, has to come to terms with his own privilege. He saw a beating and walked away from it. He could continue walking away from issues like this his whole life and his life would be fine. He worries that someone saw him at the store, that maybe he was caught on video, that the incident will mess with the dynamics of the school's basketball team and his chance at a scholarship. Finally, his friend points out that he's not the victim here, that it's not about him, and something clicks. I love that this book is out there for people to read and consider and use as a way to broach what can be a difficult discussion topic. There are so many vignettes and conversations that can be used as jumping off points for discussion, so many useful questions and comments that people can use as they consider their own lives and decisions. I especially think if you have middle school or high school kids who are aware of everything happening in the US right now but don't really know how to process it or how to respond, this is a great book to give them. And then talk to them about it, too. I've only read Baldwin's nonfiction a la carte, single essays here and there, but I do want to read more of it at once. His writing's so so lovely. Ok, deal! I have Magoon's book on hold at the library. I fell in love with Baldwin's writing last year when I gobbled down Giovanni's Room. I can only imagine how The Fire Next Time is going to lay me flat. And per your recommendation, I will definitely try All American Boys.